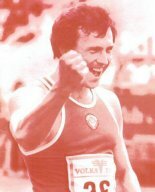 KIROV (RUS): RusAthletics.com informs about the death of former succesfull decathloner Grigoriy Degtyarov at age of 52. In 1984 he scored national record and won in Gotzis. In 1986 Degtyarov won the Goodwill Games and his Russian record 8698 from 1984 is still valid. After his career he worked as coach, was chairman of regional sports commission and worked at the university here. In 2009 he got the honorary citizenship of Kirov. 52, too young to die ! Very sad new !